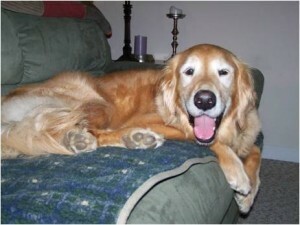 Seamus became part of the Bell family in January 2010 and was adored beyond compare from the moment we met him. He was a neighborhood and family favorite. But life isn’t all about Kong Balls with peanut butter, ice cream, and car rides – Seamus was an avid Goldheart volunteer. He helped to conduct 15 home visits, represented Goldheart as a handsome and friendly Golden ambassador at events in Maryland and Pennsylvania for 5 years, and graced not one, but TWO Goldheart calendars. If only love could have saved you Seamus, we would never have lost you.